What's new on this announcement - ".....will be victimized...." ????? 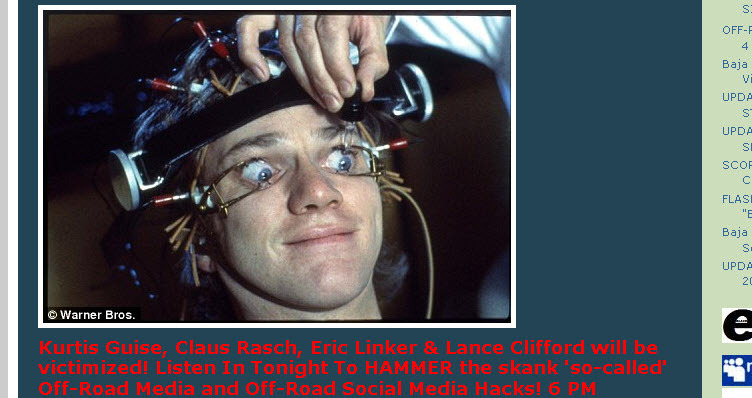 I dont know Kurtis Guise, Eric Linker or Lance Clifford, I know very little and do not have a very high opinion about Klaus Rasch but no matter what - I'm sure they all wetting their pants with you treating them digital...! ROFLMAO - you are such a clown. If being stupid would make small you could parachute underneath a carpet man!! You stealing and defrauding of people, the off-road sport and Baja since years Mike Overcast as stealer, dealer and off-road media terrorist. You don't need to announce your antics Mike Overcast (and the aka's used). New is maybe that Michael Noval joined the scumbag squad and that your thievery is sponsored by Dantes Modular Performance. There is a saying: "If it looks like a duck, walk's like a duck, quacks like a duck it must be a duck!". Well in the Mike Overcast scumbag case that saying is: "Mike Overcast is fishy and stinks, Mike Overcast actions are fishy and stink, Mike Overcast so called "reporting" is fishy and stink, Mike Overcast supporters are dubious, fishy and stink!!" So we can say: Welcome Michael Noval, quack, quack... kinda fishy small around you. Save yourself talking about Baja and racing and motorsport. All of that requires a care that is based on ethic behavior. You hang out with Overcast "MonsterScumMike" and you give up on that. One more thing Overcast, you are not dumb or dumber - you are THE dumbest. Learn at least to write names correct!! And for all others little announcement: stay tuned!! 2 years collected information coming up. Who works with Mike Overcast North and South of the border and at Baja Sur? Who is double-faced and uses that scumbag and his slanderous leeching of the sport and Baja as agent provocateur to make some bucks while talking otherwise when communicating within the familia?? You might be surprised!! Check the Mike Overcast whistle-blower blog!! Mike Overcast and his supporting scum exposed! !